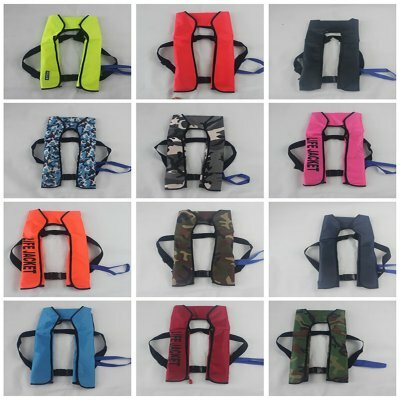 Successfully Added Quality TPU 5s Automatic Inflatable Lightweight Life Jacket Slim Inflate Survival Aid Lifesaving PFD Fit for Adult and Youth to your Shopping Cart. Material - Made from best quality TPU composite fabric, with excellent aging resistance and hydrolysis resistance. Comfortable Design - Features with lightweight and slim, soft neckline and adjustable belt fit for adult and youth. Feature - Automatically inflates in 5 seconds when immersion in water, or when the wearer pulls the inflation handle. Unique Design - CE Certificated & SOLAS approved USA 3M reflectors. Highly visible in dark, the use of more safer. Occasion - Flood relief, public security border police, maritime police surveillance, fire and other rescue fishing places. Occasion: flood relief, public security border police, maritime police surveillance, fire and other rescue fishing places. water, When the wearer falls into a coma, It can provide the best safe rescue.